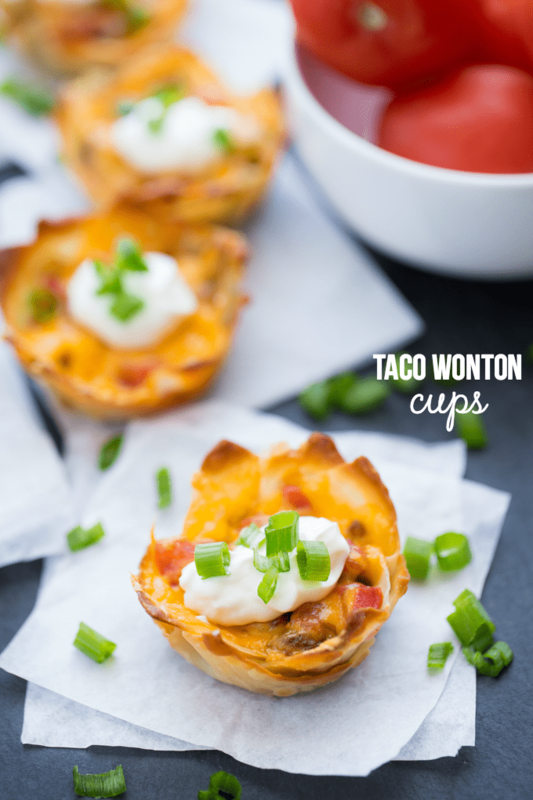 The Pizza Wonton Cups I shared last week inspired me to create more wonton recipes like these yummy Taco Wonton Cups.. The only thing they have in common is the same crispy wonton shell and the fact that they make an addicting appetizer. I love the flavour of tacos so it was a safe bet that these little guys would be a hit with my family. 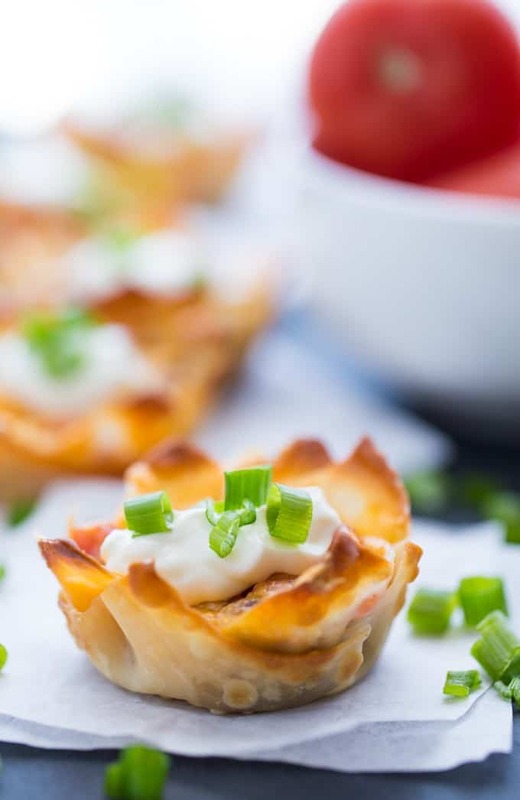 My daughter suggested we do an appetizer night with only wonton cups! I guess I better start thinking of more recipes to make! I made extra beef and added whatever toppings I had leftover to make a taco salad. I mix up salsa and sour cream to use as dressing so this recipe actually makes two recipes in one! If you prefer to make your own taco seasoning versus using the packaged stuff, feel free. I bought a bunch of the taco seasoning packets since we make tacos often around here. I’ve made my own in a pinch, but with mixed results. The last time I made it, the tacos were the blandest thing ever. I need to tweak my homemade taco seasoning recipe a bit so it has more life to it! 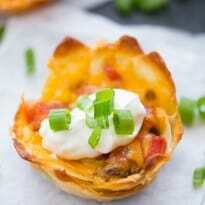 I like adding sour cream, tomatoes and green onion to my Taco Wonton Cups. Oh and let’s not forget cheese. Lots and lots of melted cheese! Salsa would also be yummy too. Serve this appetizer at your party or get together. I’d make extra though since I predict they’ll be eaten up fast. We practically inhaled them! I have a few other taco inspired recipes you might like. Try this Taco Pizza, Taco Chicken Salad, Beef Taco Pasta, Taco Soup and Fiesta Taco Casserole. You might also like these Bacon Wrapped Water Chestnuts or escargot recipe. Are you a fan of taco inspired recipes? 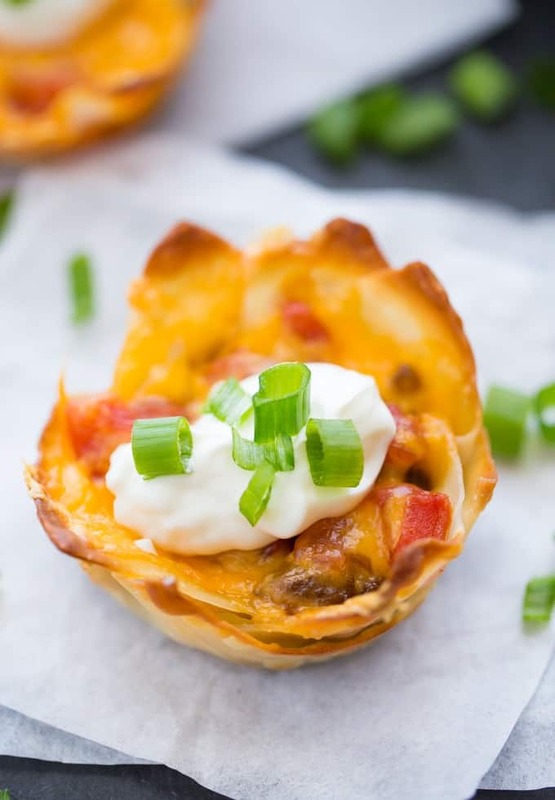 Make this yummy appetizer in a muffin tin with wonton wrappers! Top the seasoned taco beef with your favourite fresh toppings and melted cheese and watch these crispy treats disappear in a flash. Add ground beef and onion to a large skillet. Cook on medium heat until ground beef is browned and onion is softened. Stir in taco seasoning mix. Add 1 to 2 tsp of ground beef mixture to each wonton cup. Top with 1 tsp diced tomatoes and green chilies. Sprinkle cheese on top. Bake for 10 to 12 minutes or until cheese is melted and wonton is browned. Top each wonton cup with a dollop of sour cream and a few green onions. Serve hot. I love how your daughter thinks, everything made with wontons are awesome, I love how crispy they are, in fact I just plain ole love wontons!! Oh wow we would all love these! Reading this and looking at your great pictures is making me hungry. Thank you for a great idea and the recipe. 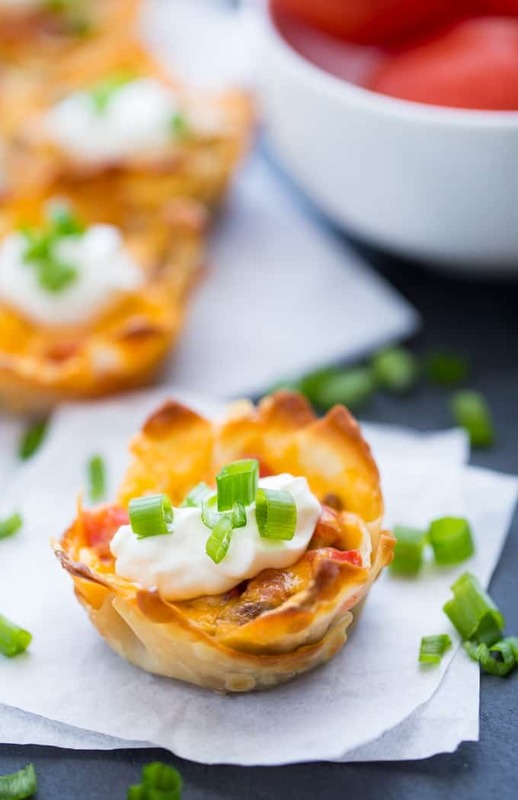 Loved how versatile wonton cups are! I liked your pizza version, and this taco version looks even better! What a fun idea. Perfect for a snack, an app or a meal! THAT is a great idea. Appetizers or dinner. I might try these if we get guests next weekend. Or maybe treat a few people during the week. Thanks. 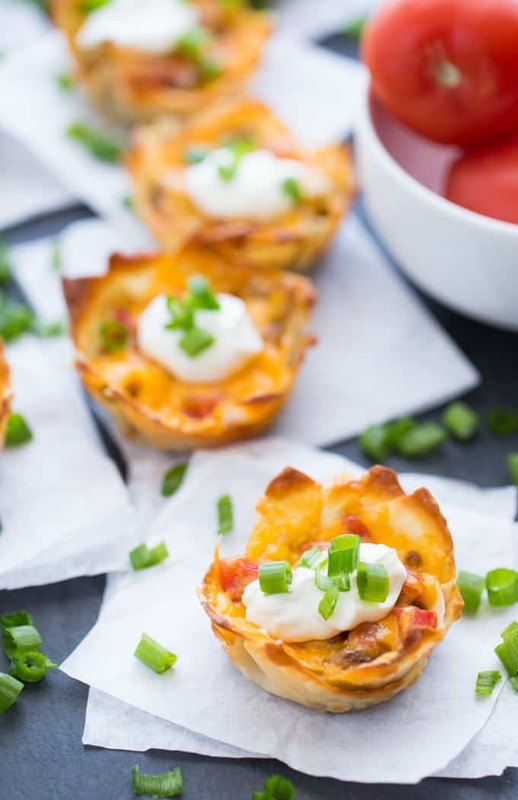 These look so crispy and cheesy and yummy! They’re definitely getting bookmarked! Thanks for linking up with Merry Monday this week. These look like some tasty little bites! Would love it if you shared on the “What’s for Dinner” link up! What a great idea for an appetizer, looks awesome! Thanks so much for sharing with Full Plate Thursday and come back to see us real soon! These sound great. Anything mexican is great. What a cool idea!!! Once you get started with that idea you could go almost anywhere!! Way cool! Thanks! These sound great,i can’t wait to try them.